Real Madrid attacker Gonzalo Higuain has voiced his opinion that Cristiano Ronaldo and Lionel Messi are both extraordinary players, and has refused to make a choice between the duo. Higuain plays alongside Ronaldo at club level, while teaming up with the Barcelona star for Argentina’s national side, and he has nothing but praise for the two forwards. “Messi and Cristiano Ronaldo are both beasts. 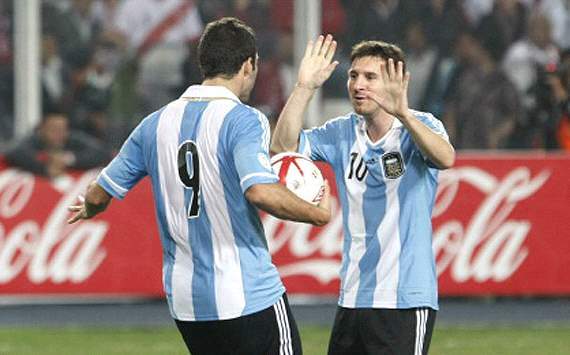 I can’t choose between them,” Higuain stated to Radio Metro. “I’m lucky enough to play with both Messi and Cristiano and I don’t like comparing them. Both Messi and Ronaldo netted twice in Sunday’s Clasico as Barcelona and Madrid played out an entertaining draw at Camp Nou. This entry was posted in News on 10/10/2012 by mirsinho.